Originally established in 1972, G.D. Lodge Architects based in Glasgow City Centre have developed a reputation for providing imaginative solutions combining design flair with technical and commercial awareness. Over the course of 45 plus years, they have forged an excellent reputation with many Local Authorities and developed successful working relationships with some of the country’s leading construction industry consultants. This thorough understanding of the current marketplace enables GD Lodge Architects to balance design aspirations and innovative thinking with commercial viability and practicality. GD Lodge were looking for an agency that duplicated this design aspiration, innovative thinking with commercial viability and practicality and portray this through a new company website. 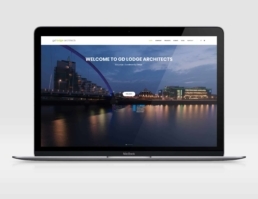 They had no hesitation in appointing Launch to design and build the new GD Lodge website to showcase projects and services to existing and potential clients and partners. The campaign involved designing and developing an engaging website, using an array of project images and content with a user-friendly system and recognisable brand identity.